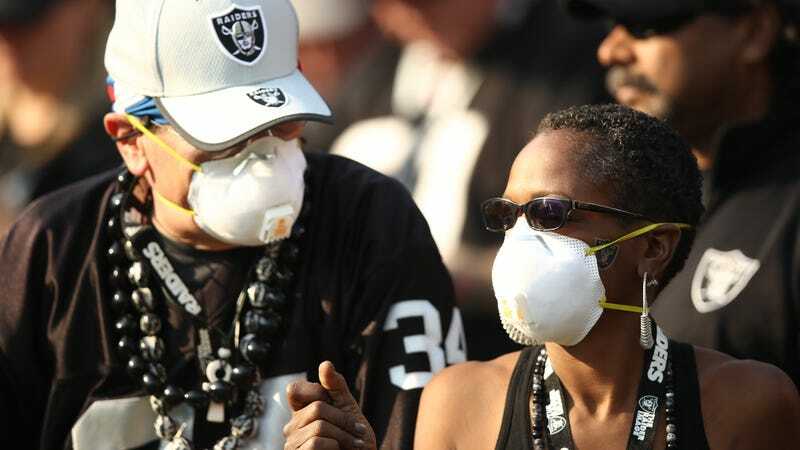 Raiders fan wearing breathing masks during last week’s game against the Chargers. Going outside in the Bay Area now is like smoking a half pack of cigarettes due to smoke from the Camp Fire. Not exactly optimal conditions for peak athletic performance. Saturday isn’t expected to be much better, which has led Cal and Stanford to postpone their annual college football showdown. Dubbed the Big Game, it’s one of the longest running rivalries in college football. But the 121st iteration will have to wait until December 1 when the Bay Area’s air will hopefully be a little clearer. “[O]nce we realized that air quality would likely not return to acceptable levels, we made the decision to postpone for the health and safety of our student-athletes, coaches, gameday staff, students, band and spirit groups, alumni and fans,” Cal athletic director Jim Knowlton said in a statement. The decision is slightly different than last week’s NFL games in the Bay Area. Air quality during Sunday and Monday’s NFL games was unhealthy in the Bay Area as smoke from the Camp Fire drifted over the Bay Area. It was frankly a little questionable that the Raiders and 49ers went ahead with their games where fans watched wearing breathing masks. Satellites captured the deteriorating air quality in the Bay Area. The before and after images show November 8 and November 15 respectively. But prevailing winds have been steering even more smoke toward the Bay Area this week. Skies have gotten progressively more smoke-clogged culminating in a horrific Friday where the Bay Area was home to the most toxic air on planet Earth. Saturday isn’t shaping up to be any better, so bumping the Big Game to December 1 was a no-brainer. This is only the second time the game has been postponed, the other being when John Kennedy was assassinated. Not to belittle sports fans, but delaying a college football game—even one as historic as the Big Game—is the most minor of worries associated with the Camp Fire, which was sparked last Thursday about 140 miles northeast of the Bay Area. The fire has burned 140,000 acres and consumed entire towns in its path. Already the most destructive and deadly wildfire in California history, there are 631 people still unaccounted for. But if rescheduling a football game gets people to focus their attention on how bad things are for the thousands of people who lost their homes and loved ones—and maybe even think about how climate change ruins everything and that we should, I dunno, do something about it—then at least there’s that. What Happens After an Entire Town Burns to the Ground?